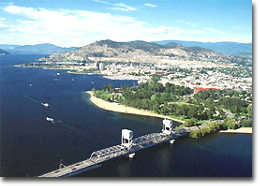 Kelowna, British Columbia, is the largest city in the Okanagan Valley and the first pioneer settlement, established in 1859. The Okanagan Valley fruit industry began in Kelowna and still flourishes. 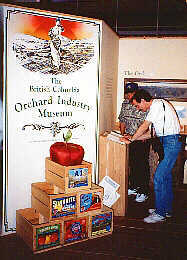 Orchards, fruit processors and an orchard museum can be toured along with productive BC wineries. Another important early industry was cattle ranching. While both are still important in the region, industry and tourism have become increasingly important with a growing population. Kelowna offers all the amenities and conveniences of a larger destination but has all of the charm and warmth of a smaller town. While right on the shores of Okanagan Lake, other lakes, hills and accompanying recreational activities are within a 15 minute drive of downtown. 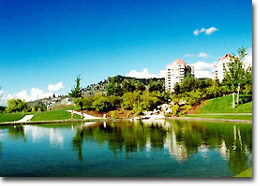 The community of Westbank is located across Okanagan Lake from Kelowna. Westbank enjoys all the charms of life in the Okanagan Valley, yet at a quieter, more relaxing pace. It has numerous orchards, wineries, golf courses, and is a twenty minute drive away from Crystal Mountain Ski Resort. 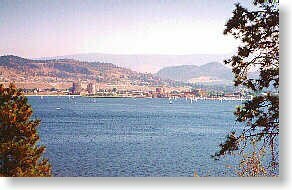 Access: Kelowna, BC, is 60 km (37 mi.) north of Penticton on Highway 97 and 395 km (245 mi.) from Vancouver. The area is also serviced by national and regional airlines at Canada's 11th busiest airport, as well as local and national bus lines. Climate: Kelowna is well known as one of British Columbia's most popular vacation destinations because of its hot summers and temperate winters with an average daytime high during July and August of 27.40 �C. The average daytime high during December and January is -0.30 �C. and the average low is -7.70 �C. Kelowna receives over 2,000 hours of sunshine annually and just over 11 inches of rain. Total annual precipitation is 366.4 mm. (280.7 mm. of rain and 105.5 cm. of snow). Accommodations: Visitors can choose from first class hotel and motel accommodations to campsites and RV parks. 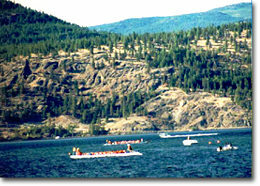 There are private and provincial campsites close to Kelowna as well as resorts by the many close Okanagan lakes.